Why do people risk their lives on perilous boat trips and take extreme actions when faced with being turned back? Referring poetically to the physical, emotional, and spiritual journeys made by asylum seekers, Origin-Transit-Destination (OTD) developed organically into a mobile performance work that generates a series of unsettling experiences for audiences, while simultaneously offering them intimate encounters with asylum-seeking artists and the places along their journey. Always active, never passive, these artists are in control of their representations at all times. First staged in Western Sydney in March 2015, OTD developed a process that is a template for site-specific, community-engaged performance that works anywhere asylum seekers or refugees live. ‘Who are we? Who is ‘one of us’? What codes must we live by? Who are we part of? Whose humanity do we recognise as akin to ours? And a further terrible question: What do we owe those whose humanity we fail to recognize?’ (Sevendrini Perara, 1968). With 60 million displaced humans on the move today seeking havens (UNHCR), how can the rest of the world, particularly those privileged to live in peace and relative justice, respond ethically? In OTD we invite, inveigle, and coerce audiences into a space of identification, recognition, curiosity. OTD is an activist work, driven by a refusal to be silent and a determination to engage in uncomfortable conversations. It deals with our societal complicity in government policy and community collusion in the dehumanising discourses passing as debate in media representations of people seeking asylum. OTD insists on the audience taking steps to walk in another’s shoes. It builds layers of experience, shared dilemmas, laughing and singing. It simultaneously introduces small discomforts – relinquishing a mobile phone, entering a blue light space alone, being assigned a name or number. It is at all times an invitation to speak. 1 Emma Cox, ed. Staging Asylum: Contemporary Australian Plays About Refugees, Currency Press, Strawberry Hills, 2013. See also ‘Art & Asylum: Politics, Ethics, Aesthetics’, RealTime, 7 September 2010, <http://realtimearts.net/feature/Archive_Highlights/9992>, accessed 1 June 2016. 2 Rand Hazou, ‘Staging Hidden Stories: Australian Theatre and Asylum Seekers.’ In/Stead, no. 3, 2010 <http://www.insteadjournal.com/article/asylum/>, accessed 1 June 2016. 3 For a more detailed account, see my review: Caroline Wake ‘Shoulder to Shoulder: Casula Powerhouse Arts Centre, Origin-Transit-Destination’, RealTime, no. 126, April-May 2015, pp. 6–7. <http://www.realtimearts.net/article/issue126/11877>, accessed 1 June 2016. 4 Jay David Bolton and Richard Grusin, Remediation: Understanding New Media, MIT Press, Cambridge MA, 1998, pp. 45, 273. O-T-D #2 Origin-Transit-Destination, Margaret Lawrence Gallery VCA, 2015. Photography: Kay Abode. Origin-Transit-Destination mobile performance. 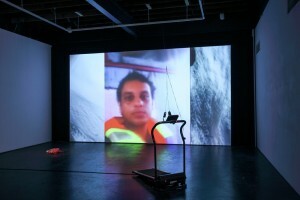 Shahla Shohni on running machine in media montage by Sean Bacon. It is a stellar title – poetic, bureaucratic, and acronymic all at once. Yet perhaps my favourite aspect is the #2. Over the past fifteen years, I have seen scores of performances made by, with, and about refugees and asylum seekers. These include autobiographical monologues, verbatim and documentary plays, physical theatre productions, circus and comedy acts, as well as performance and installation art. No matter the genre, they rarely – if ever – have a second life. One or two have toured, three or four have been photographed, five or six have been anthologised.1 Thirty-two have been catalogued in an appendix to Rand Hazou’s article ‘Staging Hidden Stories: Australian Theatre and Asylum Seekers’.2 The rest, however, live on in our oral histories of performance: remembered but not recorded, and thus with less cultural respect and reach in a world that privileges the written word. Origin-Transit-Destination #2 was a remediation in the sense that it represented the live performance by including some of the same materials: Bacon’s footage and Shohani’s treadmill. It was also a remediation in the sense that it recomposed the prior performance, by absenting the live body of the performer and pointing to this absence by leaving an orange life jacket lying on the floor. I recall Alanezi’s story about a life jacket – he took his own but gave it to a fellow boat passenger, a small girl, who he was worried would drown without it – but I did not remember the object itself. Perhaps that’s because it was not a life jacket. When I looked more closely, I realised that it was a small backpack: brightly coloured, decorated with daisies and butterflies, and a bit dirty. Did it belong to someone? Had I misremembered something, even everything? Did it matter? Suddenly I was struck by the horrible mismatch between all three objects in the space: the screen that displayed an endless sea; the treadmill that sat clumsy and motionless; and the backpack – a bouncing hindrance when you’re running and a dragging weight when you’re swimming. I felt my own backpack pressing against my neck, which was suddenly hot and clammy. I wanted to go home.